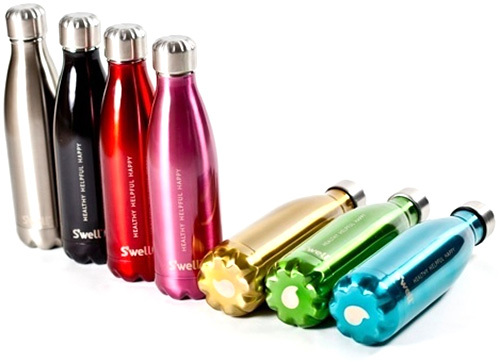 S'well Double Walled Stainless Steel Bottles | OhGizmo! By Andrew Liszewski on 04/06/11 • Leave a comment! Besides not looking like creepy limbless LEGO minifigs, these stainless steel double walled S’well bottles keep 17 ounces of hot beverage hot, or cold beverage cold, and are free from all the chemicals and toxins that plastic bottles have been associated with. They’re designed to look and feel like a classic water/pop bottle though, which also means they’ll easily fit in cupholders, bags etc. And on top of it all, every S’well purchase helps support the WaterAid organization which creates programs that improve access to safe water, hygiene and sanitation in poor communities around the world. $35, available in a wide variety of colors.